Here is an estimate of the mileage between points on the MRG. Note: Meetings are being planned to problem-solve the two ends of the MRG. (Closure of the downtown tunnel connection to the Northern Rail Trail and failed plans for the Iron Horse Park in West Leb present challenges on both ends.) Also being planned: Kiosks, maps, signage, benches, tables, naming plaques, access points, land purchase, Glen Road options. This is a big project, a marathon not a sprint; Phase 1 is complete but there is more to go! Do you have a more updated map that shows current completion as of May 24, 2016? While much construction is being planned for 2016, we have not officially opened any new sections yet. The map provided is still current. i dont see any mileage markers or even a scale on the map. maybe someone could bike it with a distance computer. I just walked from the APD lot westward to the jersey barriers by the incomplete bridge. I guessed it as 1 mi each way. The best we can offer at the moment is a description. 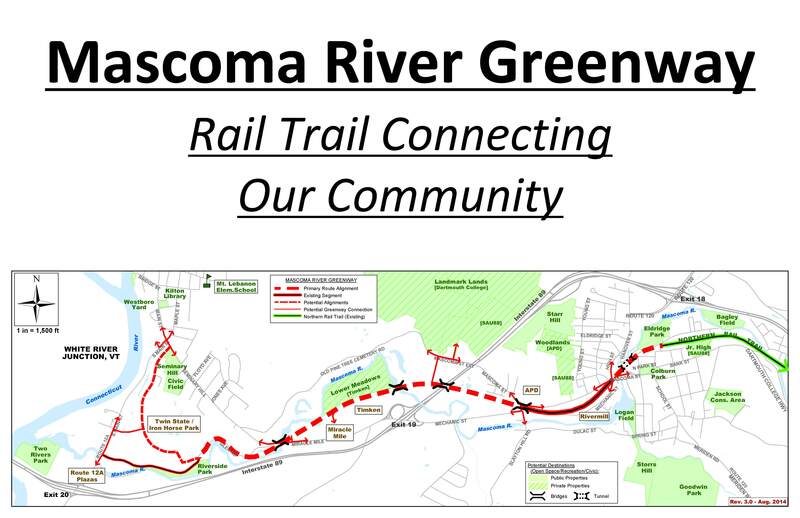 After Tuesday July 3, the path will be open and paved from High Street/Mascoma Street intersection west all the way to the upper part of Glen Road. Roughly 2.3 miles in length. The Lebanon City Council will be reviewing the tunnel options within the next 6 weeks, which will eventually lead to a decision on how to reopen the path under the mall and connecting the Northern Rail Trail to the MRG. The Glen Road terminus to the West is not the end of our dream. We would still like to connect to Riverside Community Park and West Lebanon Main Street sometime in the future. So excited about this trail and extension to the Northern Rail Trail. Not being from Lebanon, it would be nice if the map showed access points/parking. Look forward to exploring!